The Skinny: Sappy music, overly melodramatic scenes. Characters that often look like icons instead of real people, and women only used for emotional manipulation. Yet, it's still great commercial cinema. John Woo's The Killer is one of those rare films whose evident flaws somehow add to the experience (guilty pleasure? ), instead of detracting from it. It's an exercise in quantity over quality, but the importance of this film goes well beyond that. It's certainly not a triumph of subtlety, nor is it particularly adept in delivering social commentary behind its extreme sentimentalism and melodramatic events. Yet, it has a lot of heart, like Chow Yun-Fat's character. It takes its overly-commercial denomination and delivers something that is interesting, involving and new (to some degree). Woo didn't create anything from scratch like some affirm, but instead added a new layer to old themes. He presented them with new energy, great editing and an amazing sense of pace. Even with all the flaws of his oeuvre and the traps he constantly fell into (he never seemed to be able to contain himself when dealing with emotions), he had the ability to hold your attention and sustain suspense for the whole film. Woo's Heroic Bloodshed era was his way of retelling the martial arts classics of the seventies. From Ancient China, the heroic character was transferred into urban settings with Western connotations. Woo's characters feature the same code of honor showcased by the heroes in the film (and TV) adaptations of Gu Long's novels, and their roles in society are similar. Woo's work was also greatly influenced by American gangster movies of the Golden Age, the films of Jean-Pierre Melville, and Yakuza films. Of course, he also learned a lot from Coolie Killer (Terry Tong, 1982) and The Long Arm of The Law (Johnny Mak, 1984), both of which prepared audiences for the genre a few years before Woo's A Better Tomorrow. 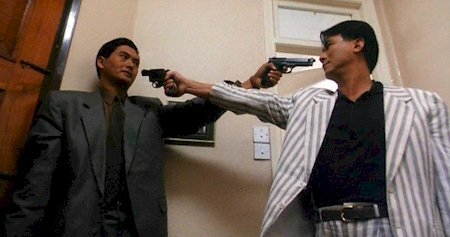 Chow Yun-fat is Jeff, a professional killer who accidentally injures a young nightclub singer named Jenny (Sally Yeh). She risks becoming blind if she can't find the money to undergo surgery, and Jeff decides to take one last job to pay for the operation. However, things go wrong and he's spotted by a cop (Danny Lee). What follows is the building relationship between Jeff and the cop against the backdrop of a much bigger conflict between justice, crime and love. Like the heroes in many Yakuza films, the conflict between giri (sense of duty) and ninjo (instinct, inner feeling) brings suffering to the characters. It also brings them together, creating a bond between the two due to what they have in common. Chow and Lee are able to shine even with Woo's manipulative, one-dimensional direction. Chow in particular is able to give passion and inner conflict to his character with just a facial expression. Although he often overdoes it, his performance is rich and convincing. His Jeff is a mix of Alain Delon in Le Samourai, Ken Takakura's Yakuza heroes and Wang Yu's swordsmen. While Sally Yeh gives a decent performance, her character is just a plot device. She's just used to render Jeff's struggle more emotional, and the character isn't given much depth. The only time where this changes is when Jenny holds a gun, determined to protect Jeff from Lee. The character of Sidney (Paul Chu Kong) is almost as interesting as the two main leads. He's the poster boy for what corruption can do to honor and friendship. His conflict is just as painful as Jeff's. The real problem comes when we go beyond the major characters. Woo's notion that there can be a code of honor, no matter what background you come from, is welcome. But he delivers this message while depicting bad and good in a very childish, black and white way. Woo's effort is laudable, but he's not someone who can handle those themes with the subtlety and the realism necessary to make an impact. His heroes aren't shades of gray because they're real, but because he paints over black and white characters with his heavy hand. If you buy it, you'll be convinced by the conflict. Otherwise it feels a little manipulative. Still, given those shortcomings, the film works on entertainment value. And it does so in a remarkable way. Its abundance of style, and the juxtaposition between romantic icons and poetic, "beautiful" violence - served with some of the best editing you'll ever see - makes for incredible scenes. Even with Woo's penchant for heavy-handed delivery, he draws truly memorable moments out of his cliché-ridden plot and tired characters. The first and final acts are simply a triumph of pacing and easily rank amongst the best action scenes ever filmed. Woo is not as important a figure as other directors from the First and Second New Wave (Ann Hui, Wong Kar-Wai, Stanley Kwan, Tsui Hark, Yim Ho, Clara Law and others) for the artistic quality of his cinematic output, and the social/political/economical commentary he offers. He's instead important for his influence in shaping commercial cinema and the action genre for years to come. His films crossed over with a new audience from the West, making Hong Kong Cinema even more successful than it already was. This film is a healthy history lesson, helping us understand what we see in today's action films.